Many employers search through hundreds of resumes each day. Increase your chances of getting noticed by employers by using a Featured Resume Listing. Your resume will show up before other candidates when employers conduct a resume search for the perfect candidate. Move to the top today! 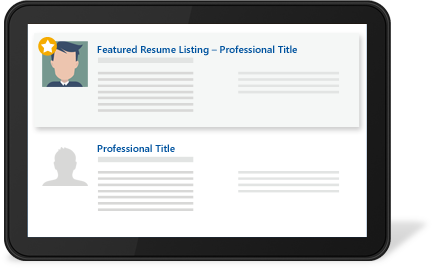 Choose from three levels of featured resume listings, starting as little as $10 for 60 days. Get noticed today and get hired tomorrow! Call 1-888-447-1193 for more information.